Scholars Indian School – established in the year 1999 having a strength of 1500 an catering the students from Kindergarten to Gr. XII both Science and Commerce respectively. The school team consists of 112 members with a task of operating on the motto of seeking true wisdom with a vision to be the centre of excellence in provision and promotion of quality education. The school is equipped with a management wherein regimented growth of a child is the prime focus in all aspects and moreover aiming at full fledged development of the same. The authorities strive in all possible ways to cater a forum for each one of them to shoulder multiple tasks and avenues to unmask their innate talents and flair. 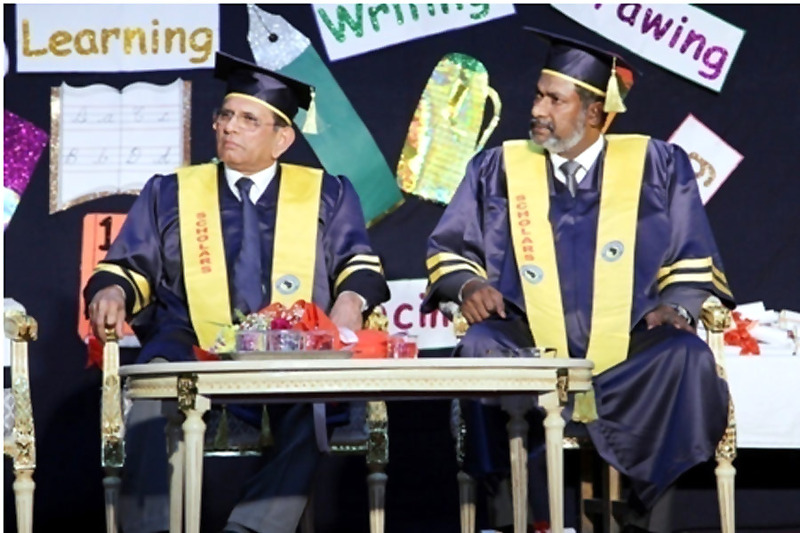 The school chairman and the principal jointly collaborate in all there ventures and their ideation has blessed the school with the finest results in all that they have undertaken. Promotion of standardized education interspersed with disciplined learning is the paramount target of this temple of education. Scholars radio and so on. National days are joyously commemorated with great zeal and vigour to instill in our learners the spirit of solidarity, brotherhood and erode social disparities and to help them develop a secular and tolerant attitude towards the expatriates of the country. The school also encourages intensive and rigorous physical activities by filliping students in various sports events through football, handball, basketball and cricket, thereby making them sturdy and physically fit. The visit to the NASA was another great venture of Scholars school and the move did add another feather to our cap. Children are well trained by a team of sedulous teachers who tirelessly work to extract their expertise and revamp their dormant skills. Teachers are rendered with the diverse enhancement programme so that their classroom teaching is made efficacious and child oriented. Academic learning is to be based on analysis, research, creativity wherein students are made to cogitate and assimilate aspects through tangible facts. Students are also lauded for their commendable achievements through the badges conferred on high achievers and this has certainly boosted the morale of the top scorers to keep reaching great heights. The school has produced students who achieved the highest marks in their higher secondary examinations conducted by CBSE Delhi, India and continuing their studies in different Universities with various subjects. We are very proud to say that the students who have completed their studies could get the placement in International fame companies. On the whole Scholars Indian School attains the status of being known in every nook and cranny of the emirate and the school is still working incessantly on further ventures for a promising tomorrow.